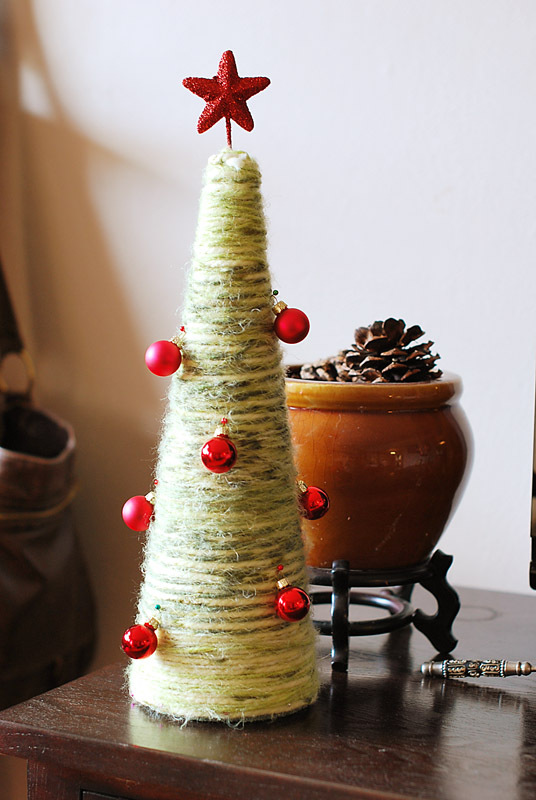 Below is the tutorial on how to make these yarn Christmas trees. All of the materials should be available at your local craft store. I purchased mine from Joan fabrics. 1 skein of a thick yarn. I used a Red Heart brand. 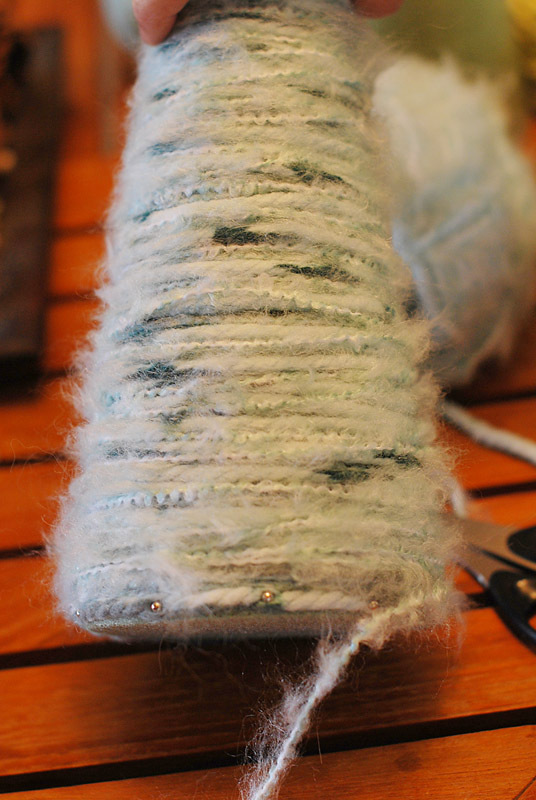 1 skein of a fuzzy yarn. 3 foam cones (usually found in the floral section) or however many trees you want to make. Accessories of your choice for decorating the trees. 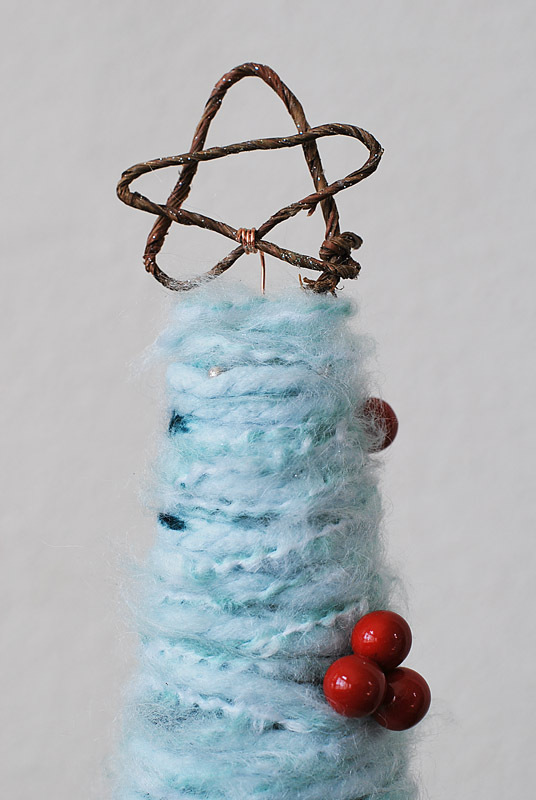 I used fake red berries, bird, nest, and stars made of stem floral wire (directions for making the stars are below as well). Christmas music (preferably something along the lines of Last Christmas by Wham). Beginning at the base of the cone, pin both yarns together to the base. Continue to wrap the strands around the base, pinning every 2" or so. 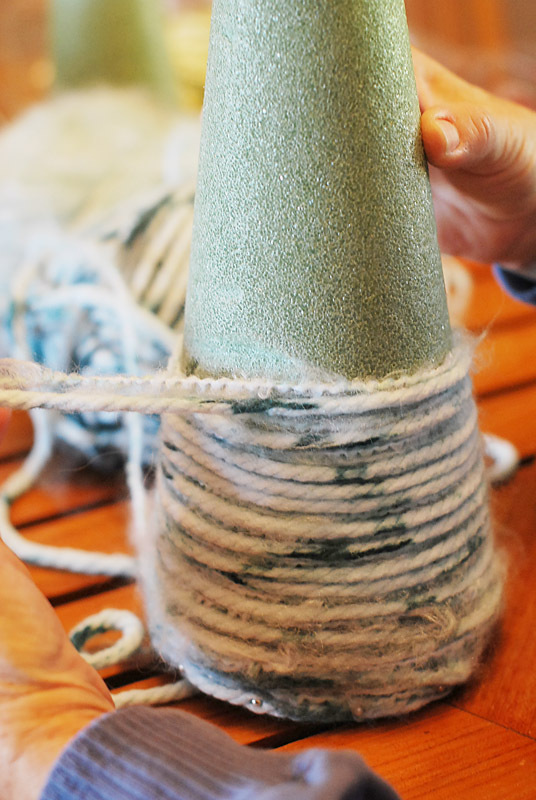 Once you have wrapped the yarns around the base, continue to wrap the yarns around the cone working your way up to the top. There is no need to continue to pin the yarn. Just the base needs to be pinned for now. 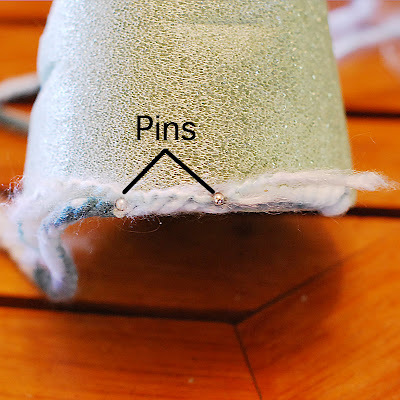 Once you have reached the top, pin the yarns around the top of the cone. 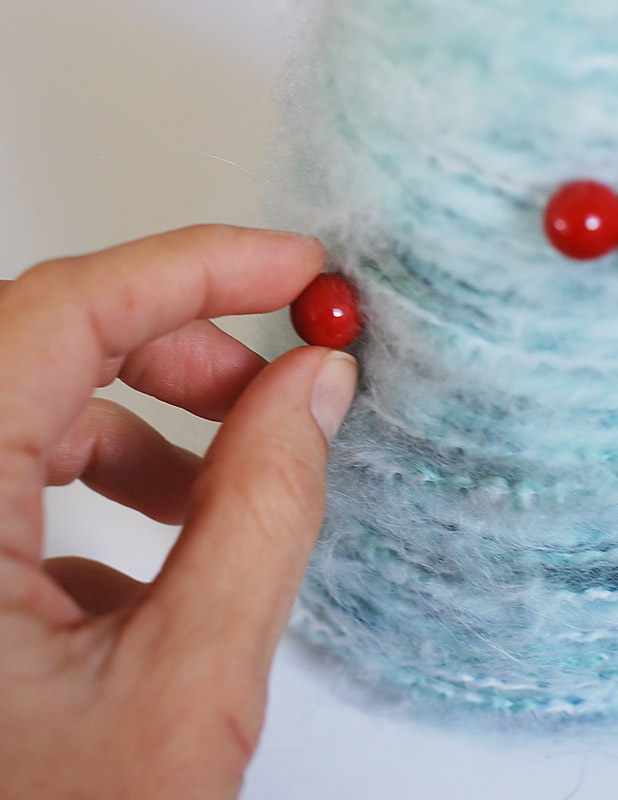 Work your way around the top of the cone in a circular direction until the top is covered with yarn. Pin where needed at the top. Be sure to cover all of the cone (the pic doesn't show this). Now begin to wrap the yarn back down the cone. 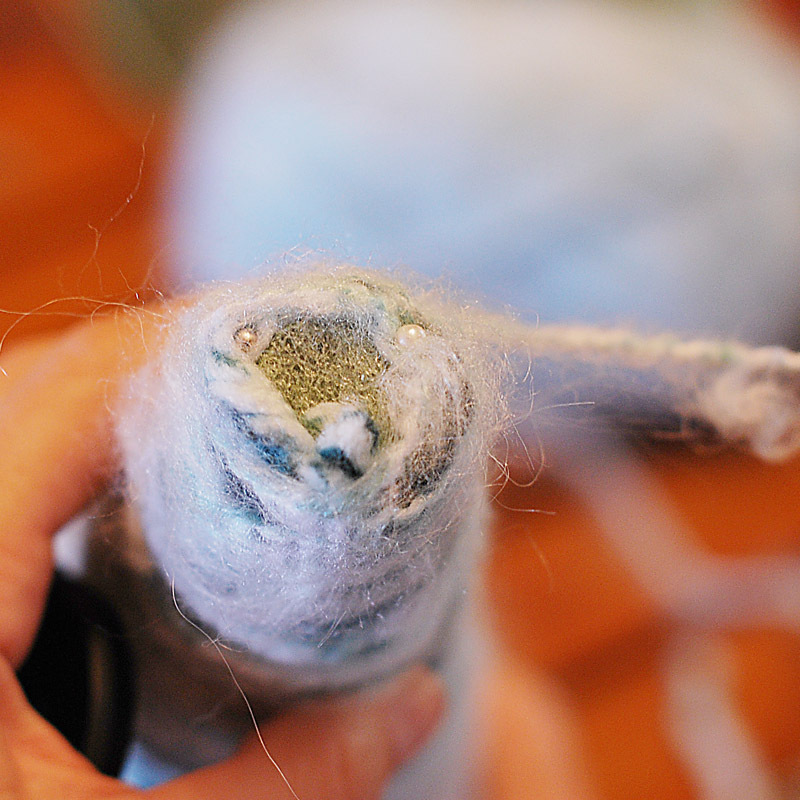 At the bottom of the cone, cut the strands and secure in place with a pin (pic doesn't show yarn cut...DANG!). You can leave your tree as is or you can accessorize. To add red berries, simply cut off the berries from the berry cluster. Be sure to leave the wire stem attached to the berry. Poke the berry into the tree. If the berry is not going into the tree foam easily, simply weave the stem into the yarn. 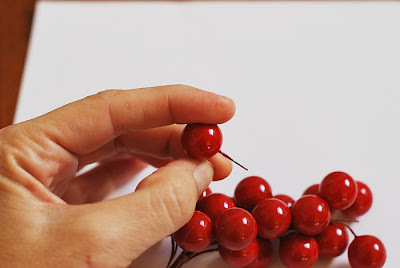 Continue to poke as many berries as needed in the tree. For my mom's tree, she pinned the ornaments to the tree. 2. 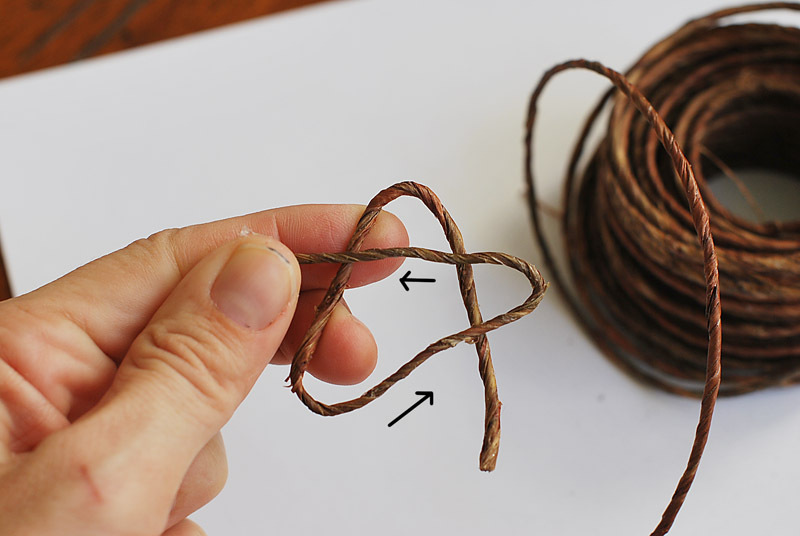 Cut off the end and wrap it around the beginning point. 3. 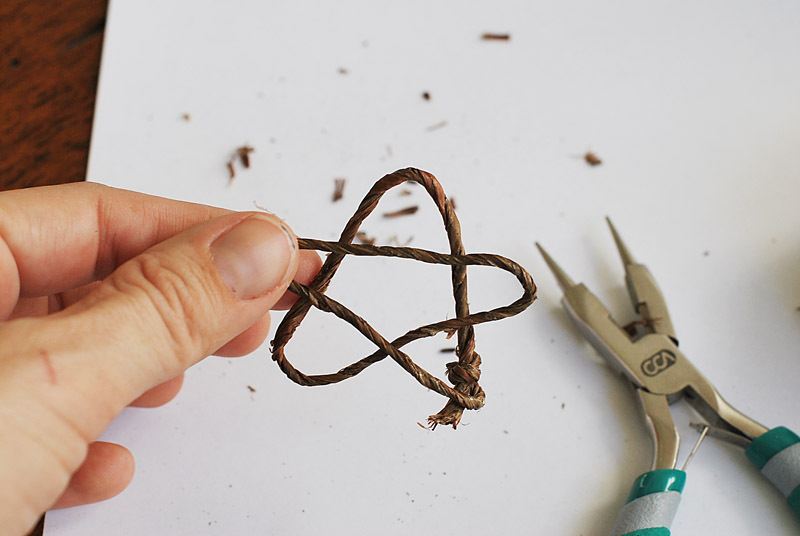 Lightly spray the star with craft glue. 4. Lightly sprinkle some glitter on the star. 5. 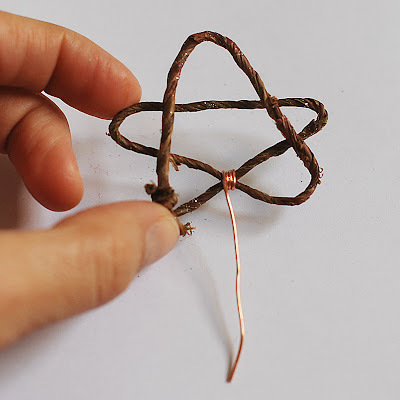 Wrap the star with the end of the 3" wire. Leave the other end straight. 6. Poke the end through the top of the tree. 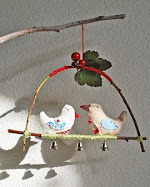 The bird and nest are from Joann fabrics. I pinned the nest to the tree top and nestled the bird into it's home. Here are the trees without the stars and with a different bird. I love handmade Christmas decorations! Please feel free to share on the Pretty Ditty Show and Tell flickr group. There's plenty of eggnog to go around. You have the most wonderul ideas! Thank you for sharing them! So stinkin' cute!! Gonna make some tomorrow. Thanks! How sweet and easy peasy breezy! Hi! I love this project. I've included a link to it on my blog post today. Thank you for the great idea! Those are super cute! Found via the post at FasterCraft! p.s. I'm going to post them on the Dollar Store Crafts facebook account. Dear Jamie, these are gorgeous and sooo pretty! I really love the idea...and thank you so much for making this tutorial for us! Yipee! :) Have a lovely merry happy day and love to yoU! Love this tutorial, I'm supper tempted to go out and get some cones and yarn to have some down time with my kids after a painful semester. These are very cute and look simple enough. Now I know what I can do with my cheap synthetic mohair. Thank you for being so creative. Great project! I am going to get my kids to help me too. 5 december I will post on my blog that talks about this tutorial. Come and see me if you want. How cute! I want to make some for sure! Love these! Beautiful colors and yarn chosen. TFS! If there wasn't a blizzard outside I would be on my way to the craft store to get everything to make these! They look so fun, and I bet you could leave them up past christmas as a winter decoration. I was so excited the snow cleared here today so I could go out and buy the stuff for these. I loved the blue and red together.. so mine is looking very similar only I found a red bird. Thanks Again! This looks so great! I just posted a link to it from my blog! Wow, these are so, so beautiful! Thanks tons for these, I'll be linking. And where have you been all my bloggy life...and a preference for Wham to boot...what a hoot!!!! Very Cool! Thank you so much for sharing! My son and I plan to do this during school break. Apologies for being so late to the party :>) but I just found this and think they're ADORABLE! What a great tutorial! I linked to this on my weekly roundup - thanks so much for sharing! YEY!!! 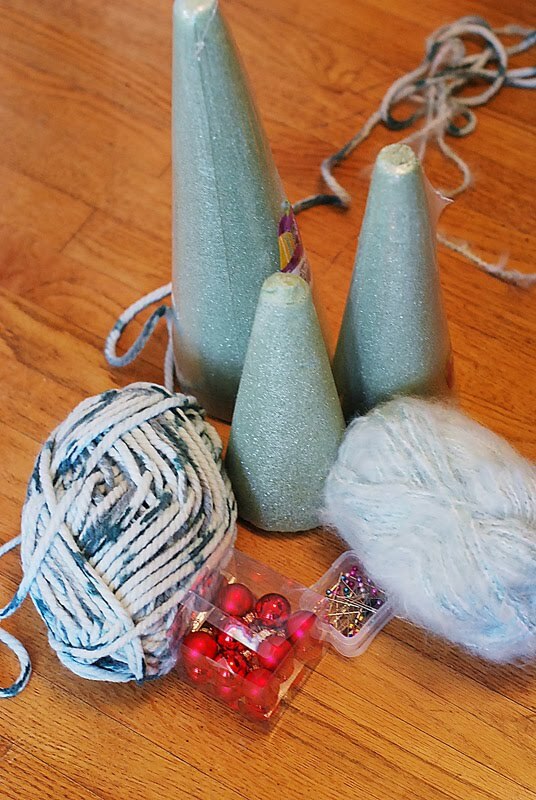 I love to do yarn stuff during the Christmas season thank you for the tips ! I just cam across these trees and I am in love! I may just skip decorating for halloween and thanksgiving and go right to Christmas! Thanks!! You have my permission. Thanks! found your blog from Lemon Squeezy Home and love it! I'm going to be following you! This is very cute idea..The Christmas tree is so beautiful. I love to make it for me but it is too late..:-(. I wish I will surely make it next year. This is brilliant idea. I just moved out in my new house and want to similar Christmas tree for my living room. The tutorial you shared is awesome. I don't think so I will get any kind of difficulties while making it. Wow, what a cute Christmas trees! I love the idea of having a bird on it instead of the star, it looks gorgeous, thanks for the tutorial, this will definitely on my list for the next Christmas. I love this project, the yarn Christmas tree with a bird at the top is so adorable. I'd love to have this coming Christmas holiday. Thanks for the inspiration. Wow, how cute is that Christmas tree :)it's really fantastic to see such creative craft made from simple materials can turn into something like a work of art. This gonna be on my list for this year's Christmas holidays. They are cute. Is this meant for a decoration like on for the table? When it comes to cleaning, commercial cleaning supplies often get the boot in cleaning books. Comparably, the difference between using commercial and natural cleaning solutions is the time and effort required to scrub, having a clean green feeling, and the safety of our health. Yes really the Christmas tree was looking very nice with the other decorations you provided. Wish you a merry Christmas. Attractive posts to read, very nice blog. I subscribed to you via RSS for your latest updates, keep up the good work. These are absolutely adorable. Thank goodness for pinterest. lovely! 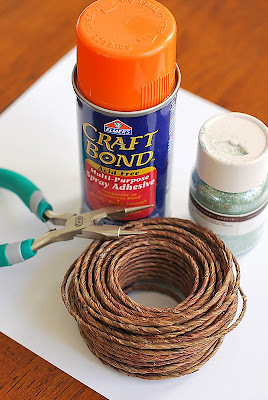 I found these through the Holiday eBook from All Free Holiday Crafts, they included my Toilet Paper Roll Wreath as well :) I will definitely be trying your project for the holidays this year! these are adorable. love the fuzzy yarn, the berries, and the star. just perfect. Hey I liked the blog posting. Thank you for sharing the valuable information on this blog. Waiting for such more good postings one. this website. Great work! I love your trees! Thanks for sharing the tutorial. 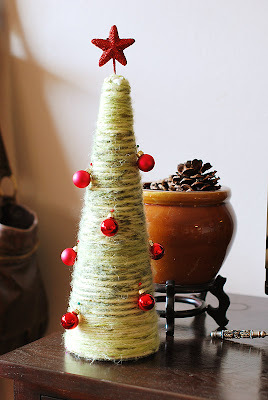 I post it in my blog http://krasart.com/2011/12/20/diy-yarn-christmas-tree-tutorial-by-pretty-ditty/ and link it back to you. Thanks again! Good Work!I like very much the Christmas tree.The art of making tree is so nice next Christmas I will make a tree like this. Interesting blog and the title of this blog is so attract me to read this. Have done a very nice and creative, Thanks a lot for your info,the best page up until now. I'm loving this so much. you did great job bro keep it up. Thanks for sharing this article, it is a good one to say the least. 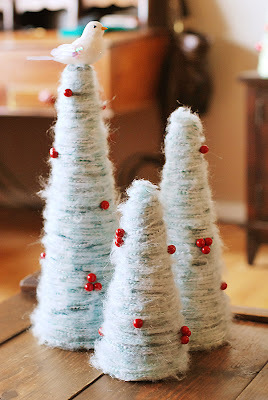 Going to make these for Xmas this year love them,also very easy to follow tutorial thanks. i thank you so muche for this great tutorial ! 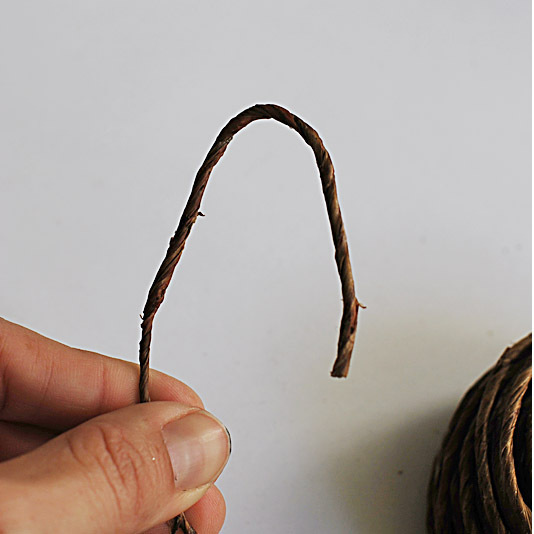 Awww that was sooo cute, I love that cute decorating idea for your christmas tree. Thanks for sharing. Really its nice to see the craft design.Thank u for sharing. Great post and nice blog shared here.Its an beautiful craft design. Great article and thanks for sharing this post. 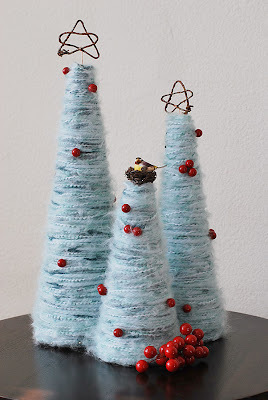 Thanks for sharing a very interesting article about Yarn Christmas trees tutorial. This is very useful information for online blog review readers. Keep it up such a nice posting like this. Paper Zone fulfill all the client requirement as and when required with pan India service at earliest.